The Gospel of John Chapter 1 reveals John the Baptist as a major player in the greatest story in history. But his cousin Jesus Christ is the real star and John the Baptist knows it. Your learning comes from reading and studying the Bible. After you've read the Scripture passage answer the questions below. It's a good idea to do them every day, so we offer to email the questions to you every day - just sign up below. If you want the questions emailed to you, please complete the form below. You'll get 6 emails with the questions for each day. A seventh email will allow you to compare your answers and take you to Chapter 2. Want the Daily Questions by Email? Click here to download a workbook with the daily study questions for the Gospel of John Chapter 1. 1. What do you learn about God from reading verses 1 and 2? 2. Jesus Christ is referred to as the Word. List 5 aspects of Jesus Christ we learn from studying verses 1-4. 3. 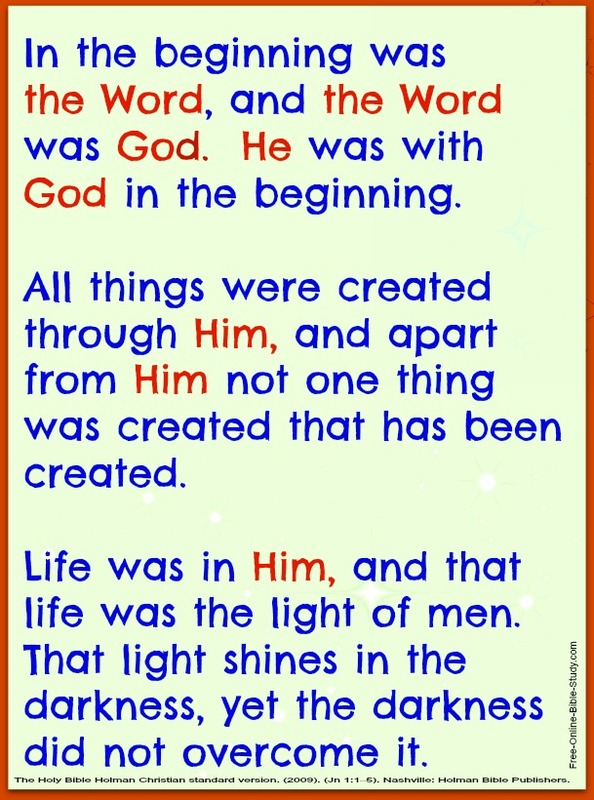 Jesus is referred to as the Light. List 5 truths you learn about the Light from reading verses 4 though 9. 1. Compare the 2 basic reactions man has to Jesus as the Light in reading the Gospel of John Chapter 3, verses 19-21. 2. What truths can you see by studying the Epistle of I John Chapter 3 verse 1 and then studying verses 10-11? 3. Give some examples of how the world did not recognize and did not receive Jesus Christ. 1. In reading verse 16 it says we have received blessing after blessing from Jesus Christ. What blessings have you received? 2. Why would the message John preached as shown in verse 15 seem strange to the Jews? 3. List 5 things you learn about John the Baptist from reading Luke Chapter 1, verses 14-17 as given by the angel Gabriel. 1. What do you learn about John the Baptist from studying what Jesus said in Matthew Chapter 11, verses 7 through 14? 2. From the readings of Matthew Chapter 3, verses 5 and 6, and Mark Chapter 1 verse 5, why did the Jewish leaders send messengers to inquire of John the Baptist who he was? 3. From the nature of the question the Pharisees asked in verse 24, what was their view of John’s authority to baptize? 1. What reason does John the Baptist give for performing water baptisms and what life lesson do we gather from this concept today? Who was John the Baptist with when he said "Look, the Lamb of God!" 1. What can we surmise of the character and life of Andrew from studying the following verses? 2. What do we know about Peter from a study of the following verses? 3. Compare Nathanael’s initial impression of Jesus when he was first told of him to the greeting Jesus gave Nathanael and his impression of Nathanael. We pray this study of the Gospel of John Chapter 1 has blessed you and encourages you to continue to study God's Holy Word.